Chaz Bono’s recent effort to lose weight and tone up has paid off as he’s been showing off a slimmer figure over the last couple of months. Wearing a pair of bright red sports shorts, Chaz Bono, 44, looked like he was enjoying a casual day which involved a spot of shopping. 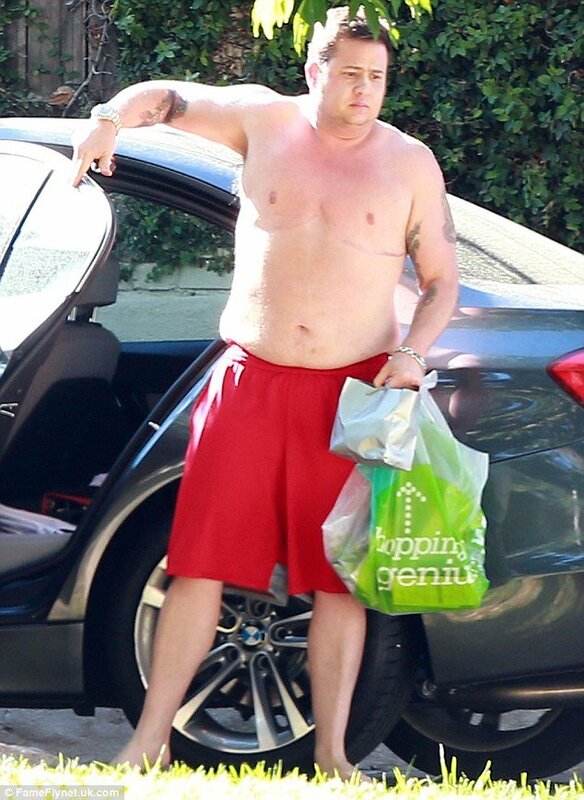 As he retrieved a number of shopping bags from his car without his top on, his tattooed torso could be seen as well as the scars on his chest. The only child of music legends Sonny and Cher, Chaz Bono was spotted earlier this year looking slightly worse for wear after suffering injuries whilst shedding 60 lbs of weight. However, with the injuries behind him the Dancing With The Stars contestant certainly has managed to keep off the weight. This has no doubt been helped by him starring in a 30 minute musical adaptation of Independence Day alongside Brooke Seguin, that certainly keeps him on his toes.